Dearest Blog: Thanks to my employer's generous early dismissal yesterday, I got an early start on the holiday weekend at Marquee Cinemas. 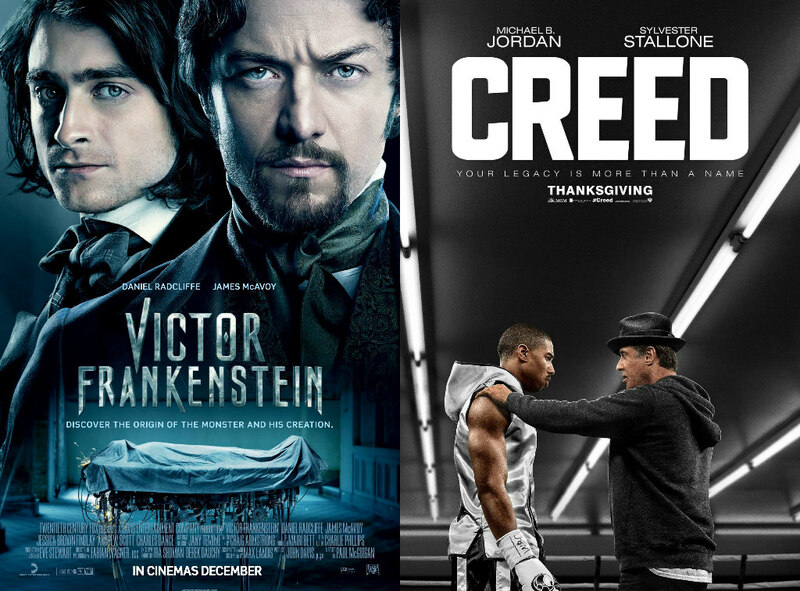 Hollywood owed me an apology for those two stinkers last weekend, and I'm pleased to report they couldn't better have made up for it than with Victor Frankenstein and Creed. Spoiler level here will be mild, nothing you wouldn't know from the trailers. The movie boasts lovely costumes and set design, a healthy dose of humor, some groovy effects, the expectedly-high gross-out factor...annnnnd...for as much as we see of him, the Monster looks terrific. Victor Frankenstein runs a quick 109 minutes and is rated PG13 for "macabre images, violence, and a sequence of destruction." As with any re-imagining of a classic, Victor Frankenstein won't be everyone's cup of tea, but I kinda loved it. Of a possible nine Weasleys, Victor Frankenstein gets seven. Next on the docket, the latest installment in the Rocky saga: Creed. An aging Rocky Balboa reluctantly signs on to train the young son of his friend and former rival Apollo Creed. It's a holiday weekend in the US and I'm sure everyone's busy with family and friends and shopping, but as a self-decreed Internet authority, I must insist you MAKE TIME TO GET OUT AND SEE THIS MOVIE. Michael B. Jordan is amazing as the young Creed--so good you'll have no choice but to forgive that last Fantastic Four movie!--and Sylvester Stallone is as reliable as you'd expect as the reluctant mentor. I'm sure he could play Rocky in his sleep by now, yet he's no less effective, sympathetic, or heartbreaking for it. Creed moves at a good clip, despite a runtime that's a tad longer than it needs to be. The boxing action is well executed--and thus a bit much for the non-enthusiast--and the story is extremely well crafted. If the movie is a tad hokey at times, it's so much more genuine and emotional and inspirational, with just enough of the right kind of humor at the right times. The Liverpudlian baddie is so broadly drawn I half-expected his walkup music to be Love Me Do, but that's a tiny quibble with what's overall a really-extra-super-great movie. (Also his handler is Dwalin from the Hobbit, so...POINTS!) Creed clocks in at 133 minutes and is rated PG13 for "violence, language, and some sensuality." Creed will leave you feeling like Judd Nelson at the end of The Breakfast Club. It is everything I love about movies.